Location/ Directions: Located in downtown Dayton. About Hotel: 14-Floors, 291-Rooms, Interior Corridors, Pets Allowed (fee), Business Center, Health and Fitness Center (On-site), High-speed Internet Access, Live Entertainment, Outdoor Pool, Daily Housekeeping, Concierge Services, Lounge, Ice Machine, Porter/Bellman, Free Morning Newspaper Delivered to Room, Color Cable / Satellite TV, CD Player, Stereo, Work Desk w/ Lamp, Speakerphone with Voice Mail, Bathtub, Hairdryer, Private Bathroom, Coffee Maker, Microwave Oven, Mini Refrigerator, Connecting Rooms, Crib, Individually Controlled Air Conditioning, Iron / Ironing Board, Rollaway Bed/Cot (fee), All rooms non smoking, Hotel Restaurant, Free Parking. Railroad View: Excellent View. 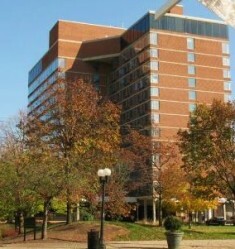 You need a high floor room on the south side (front) of the hotel. Railroads past Hotel: (Dayton Union) Norfolk Southern Railway / CSX Transportation / Indiana & Ohio Railroad. Photo Comment: The aerial photo looks southward. The Crowne Plaza Hotel is seen at the lower right side of the photo. The double track railroad is seen to the upper left side. The view from the hotel is marked with orange. 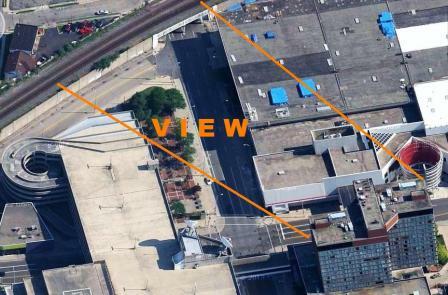 As you can imagine, a high floor room is necessary for a view of the railroad with other buildings located between the hotel and railroad. This is the busiest section of railroad in Dayton. The site of the former Union Station is out of site to the right. The station building is gone today; only two main tracks and the station platforms remain. 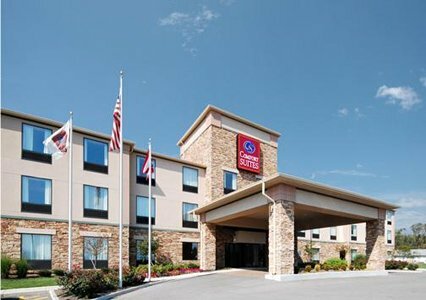 About Hotel: 3-Floors, 65-Rooms, Interior Corridors,Free wireless high-speed Internet access, Free local calls, Pet-friendly hotel (fee), Elevator, Business Center, DVD Player, Exercise Room, Guest Laundry, Indoor Heated Pool, Outdoor Parking, 100% Smoke Free Hotel, Bus & Truck Parking, Free Hot Breakfast, Cable/Satellite TV, Free Local Calls, Free Wireless High Speed Internet Access, Hair Dryer, Coffee Maker, Desk, Individual A/C & Heat, Iron & Ironing Board, Microwave, Refrigerator, Voice Mail, Wake-Up Service. Railroad View: Poor View. There is only a small area between the trees where you can view the trains. You need a room on the 3rd floor on the front of the building. Rooms on 1st & 2nd floor are too low, and view will be blocked by residental houses located between the railroad and the hotel. Rooms on the north end of the building are best for a railroad view. Windows do not open, and trains can not be seen at night. Railroads past Hotel: Norfolk Southern Railway / Indiana & Ohio Railroad (?). During my 15-hour stay; only three Norfolk Southern trains past. All were during darkness. I was able to see the headlights, and some lighter colored freight cars passing behind mostly trees. I was in room number 325, which gave me about as good as a view that I will get. 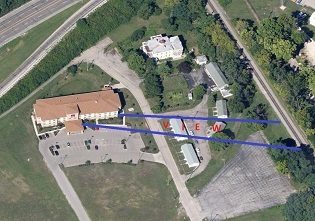 Notes: The motel is located across the street from the National Museum of the US Air Force. Photo Comment: The center photo was taken from room # 325. There is not a train in the photo since none had past in daylight during my short 15- hour stay. The area between the yellow marks show where I was able to see passing trains during the night; I have to admit, I had to stain my eyes to see them overnight. The aerial picture shows the Comfort Suites near the left side of the photo. The railroad can be seen along the tree line. There are several single story structures (apartments) between the motel and the railroad. These homes will foul the railroad view from 1st & 2nd floors. Cooler months when the leafs are off the trees may increase the railroad view.